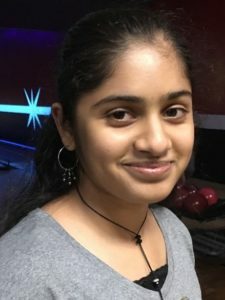 Kaviya Anjali Sathish is a teen from Cary NC, attending 9th grade at Green Hope High School. She is elected as a Lead Teen at the Cary Teen Council for her service and growth. She is passionate about volunteering with the Cary Teen Council and the Library. She has put in hundreds of volunteer hours at these places. As a part of her volunteering, she has cleaned streets, roads, packed and served food, helped senior citizens, cheered in 5k runs, created awareness of recycling, supervised children with varied abilities in many events including day camps, assisted peddlers at the boathouse, conducted games and crafts for the families, and also washed dogs for the pet families. This straight A student is American Red Cross certified babysitter and loves to dance to bollywood music. class="pirenko_team_member-template-default single single-pirenko_team_member postid-4123 samba_theme samba_left_nav samba_left_align samba_responsive ecwd-theme-samba wpb-js-composer js-comp-ver-5.4.5 vc_responsive"